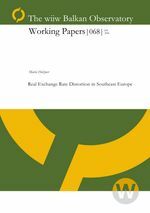 In this paper, first we investigate to which extent the real exchange rate is distorted in the 7 Southeast European countries (SEECs), and compare the findings with other countries in Europe. Second, we shed light into possible determinants and effects of the real exchange rate distortions. Finally, a policy change away from a possibly distorted real exchange rate in the SEECs is being simulated. The results indicate that especially the West Balkan countries have overvalued real exchange rates, while other transition countries' exchange rates are rather undervalued. Some of the main determinants of the real exchange rate distortion are related to the inflow of remittances and FDI, while it was found that nominal exchange rate depreciation and trade openness reduce the real exchange rate distortion. The simulation model shows that a devaluation can have large positive effects on domestic output, exports and trade with self.